After racing back up to the car at Spirit Lake, we had a dilemma concerning where to go for sunset. The sky was already mighty good where we were, so we could just stay in the area for what would likely be a safe bet, plus some good late afternoon light. …Or, we could race against the clock, heading 90 minutes to Lake Trillium Campground for the sunset on Mount Hood. This was far less of a sure thing. For starters, sunset was about 95 minutes away, and we had to stop to get gas. Second, the mountain could easily be cloud-covered, as is often the case. Naturally, we opted for the location that presented more challenge and drama. (After all, what fun is photographing a “sure thing”?) Perhaps “challenge” and “drama” are themselves overwrought terms to describe our journey to Lake Trillium. It’s not like we were dodging menacing life forms and trying to outrun lava flows or anything–we were simply taking a drive through the beautiful Oregon countryside, hoping not to encounter and traffic that would cause us to miss the sunset. As we got closer to Lake Trillium and Mount Hood, the prospects of a good sunset began waning. The sky was looking cloudier and darker, and the chances of the sun breaking through were increasingly limited. When we did get out, I was the lone optimistic voice in the group, saying all we needed was a little bit of a break in the clouds at the peak of the mountain and a little hole for the sun to get through, and we could have something killer. I think this statement was met with a collective eye-roll from everyone else, as it seemed pretty obvious that we were going to be shut out. My optimistic thinking has turned out to be wrong many times in the past, and it seemed certain that this was another such time. However, here I was vindicated, as it seemed like only a few moments after I said this, the clouds aligned, with the sun breaking through at the horizon and what was above the peak of Mount Hood also breaking apart. Everyone scrambled to get their gear and fire off shots, before the cloud cover returned and ended what turned out to be a killer sunset. I may be wrong 8 times out of 10 when it comes to sunsets (and that’s if I’m lucky), but my inveterate optimism paid off that night, and I’ll gladly take batting .200 if it means being rewarded like this! For this photo, I used my a Nikon D750 and Nikon 24-70mm f/2.8, plus my MeFoto travel tripod. Do you “never give up” when it comes to chasing the light, or do you throw in the towel early on to avoid disappointment? 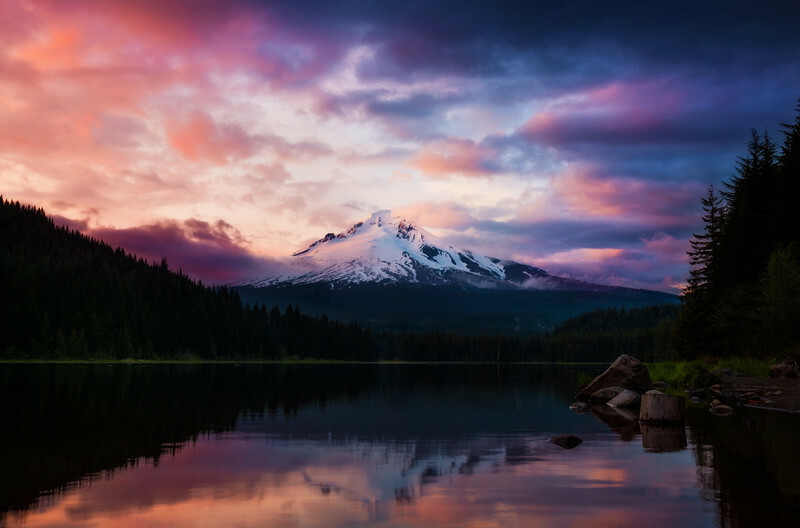 Ever been to Mount Hood? Any other comments? Share your thoughts on this, questions, or anything else, below! I basically love this photo. I feel like you must have so much good stuff just waiting for its time. Superb capture. I personally have found myself being very patient in my photography lately. I use to be hit and run capturing more quantity over quality which is a shame. Lately I have been spending more quality time with each location and I feel like the payoff has been much better. That break in the clouds landed you the big fish. Congrats for staying the course. Love the photo!!! I’m going to Oregon over the fourth, but we won’t be going to Mt. Hood 🙁 I agree with Sariah — keep posting, even if they are short posts!!! Well, it seems it was worth it, as that is a beautiful photo!